A delicious 'oh so pretty' colourful mix of creamy freshwater pearls, semi-precious faceted kyanite, quartz, iolite and amazonite gems are combined with artistic sterling silver wirework. Length: 45mm. Pearl 12mm. 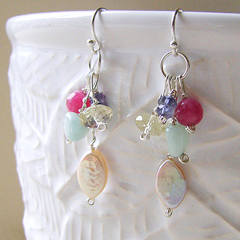 Gemstones 5-8mm. Sterling silver hooks. Large photo shows matching necklace. Made to order. 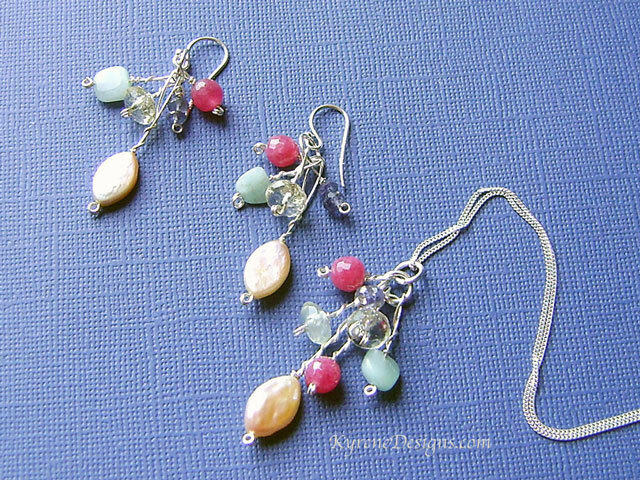 Options: contact sales@kyrenedesigns.com to swap to silver-plated clips, or extreme hypoallergenic hooks.